My yongest son is helping (?) me with sanding. I just want to send You a couple of pictures of my finished Eight-Ball dinghy. I bought Your catalouge and later the plans for the Eight-Ball through a Norwegian company called Marine Design Norway, some years ago. 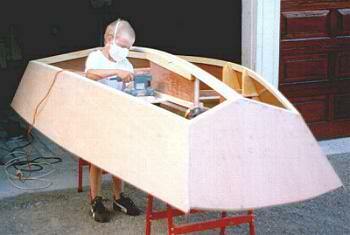 I started with the Eight-Ball to gain experience for a bigger project, the Cabin Skiff. I have also bought these plans from the same company. 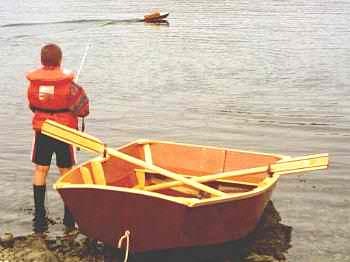 A radio controlled boat (made from drawings in the book "Boatbuilding with Plywood") together with the Eight-Ball.